When Angela Smith found out the foot clinic offered by Legacy Silverton Medical Center for the past 28 years was being discontinued she knew she had to do something. So she took a leap of faith and decided to open her own. “I just think it’s so important and these patients were in a panic,” she said. 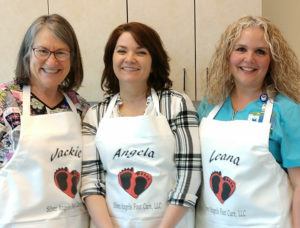 The nurse-run clinic, which Angela is calling Silver Angels Foot Care, will continue offering the same basic services – toenail trimming, filing of calluses and screening for circulation and skin issues – that the estimated 275 patients have come to expect. One of those patients, 89 year-old Herb Spady, has been coming to the foot clinic for several years and recently convinced his wife, 82 year-old Edie, to join him. Edie’s plight is not an unusual one, according to Leanna Smith, a nurse who worked at the original footcare clinic for 22 years. Although important for everyone, foot care is especially vital for those who suffer from diabetes – a disease which plagues the majority of Silver Angels’ patients. While foot care is the primary focus of Silver Angels, it’s not the only reason patients enjoy coming to the clinic. Held at the Silverton Senior Center each Tuesday and Wednesday, Silver Angels serves up refreshments in a room full of cozy chairs. And while patients sip coffee and soak their feet they are able to catch up with old friends. Silverton Senior Center 115 Westfield St.